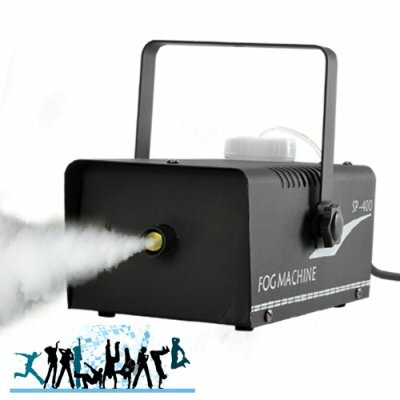 Successfully Added Fog Machine for Parties, Clubs, Halloween and More to your Shopping Cart. Use this Fog Machine with any laser projector such as our popular Purple Haze laser projector and host the party of a lifetime. This fog machine is so simple to use, it houses a 0.3 liter tank that can last for hours and gives you that clubbing and rave experience right at home. The versatility of this fog machine makes it appropriate for a wide variety of applications, such as home parties, discos, bars, pubs, clubs, raves, film making, theater productions, Halloween presentations and science experiments such as visualizing the flow of air. How do operate the Fog Machine? Simple, once you take the Fog Machine out of its box, plug the power cord into any AC wall outlet, then plug in the 3 meter wired controller, now fill the 0.3 liter tank with the water+glycol mix solution (not included) and wait up to 5 minute for the Fog Machine to warm up. Once the Fog Machine has warmed up, the two LED indicators on the wired controller will light up red. Now all you have to do is press the button on the wired remote to produce Fog. This outstanding Fog Machine is in stock now, and available to you at a factory direct wholesale price directly from Chinavasion. Click "Add to Cart" now, and within a few days you'll be the proud owner of your very own Fog Machine. Note: Fog machines do not present any health risks at all. But they should only be operated in an indoor environment that is well ventilated. Is this fog machine like the Chauvet, Antari, Koor, or Martin brand fog machines? Actually this one is better. It comes with our famous 12-month warranty and low factory direct wholesale price! Do Fog machines cause any health risks? Does this fog machine come with any liquid that produces the fog effect, such as a glycol and water mixture element? No, This fog machines is provided without any liquid produce for fog machines.